For the last several months we have been planning for the launch of this website. We were excited to share Adrian’s adventures and exploits in running. More recently, we were on the hunt for compelling stories and memorable blogs from past guides that might inspire other sighted individuals to guide visually impaired athletes. On the eve of launching our site we received the most heartwrenching news. And so it is with great love and sadness that here on the inaugural pages of our site we remember our dear friend William Korthof. 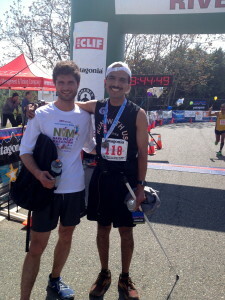 Adrian first met William in 2007 when he was looking for a guide for the running of the 21st Los Angeles Marathon. William was killed Thursday, October 2, 2014 in a tragic motorcycle accident. He was 36-years and one day old when he left us. Adrian and Willliam at the finish of the 2013 AR50. In 2007, Adrian was living about a half-marathon distance east of downtown Los Angeles in the San Gabriel Valley. 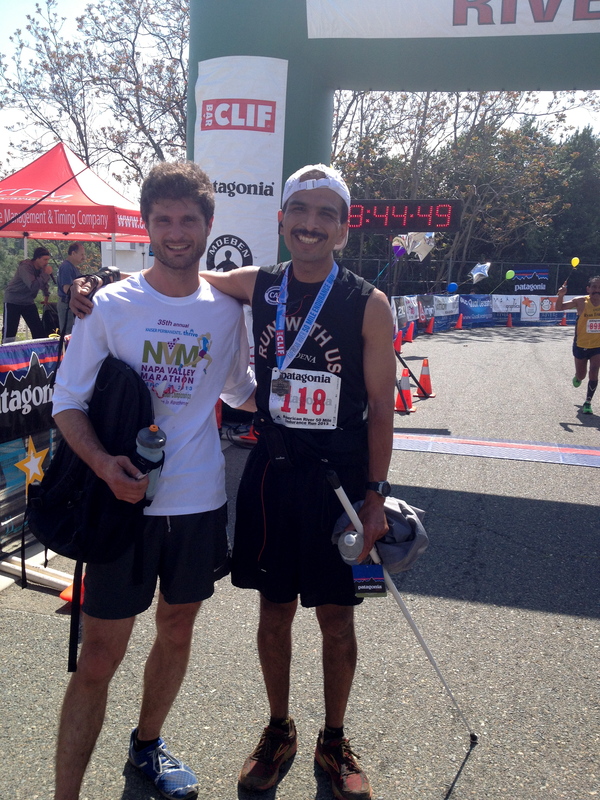 With the help of his friend and Legacy runner John Araujo, Adrian had run the 2006 Los Angeles Marathon in 2:58. It was his first sub-3 hour race. Looking ahead to repeating this feat in 2007, Adrian was already eagerly recruiting guides who could run his pace. Fellow LA Roadrunner Philip Steinman introduced Adrian to his friend William Korthof who had offered to guide Adrian. On a cold February evening, Adrian and William shook hands for the first time beneath the bright lights that illuminate the track at Santa Monica High School. Even though Adrian couldn’t see William, he could immediately feel William’s gentle nature. The two did their cool down together and William’s curious mind emerged from the shadows of polite conversation. Adrian shared that he could barely distinguish the running lanes. Not satisfied with the answer, William raised his hand in front of Adrian’s face and asked Adrian how many fingers he was holding up. Adrian could see there was a hand in front his face but he couldn’t distinguish any more than that. “It was kind of like an eye exam,” Adrian remembers fondly. Adrian was not offended. He often had the same thought himself when he was out there running. The alternative of staying home and falling into depression was equally, if not more daunting. The two of them laughed it off and continued their run. Week after week, William made the drive from Pomona in his electric RAV4 to run with Adrian. Adrian was touched by William’s commitment. Normally he just scheduled a training run with his guide about a week before the race. This was the first time he had developed a friendship with one of his guides where they were just two regular guys on a run sharing their ambitions, experiences and stories. Despite coming from completely different backgrounds, William and Adrian shared the same values. They were both very close to their families and had strong work ethics, drive and imagination. William was a world traveler and outdoor enthusiast who had cycled, hiked, trekked, driven and run everywhere it seemed. Like his intrepid friend, Adrian had boldly traveled across the country alone for races. He landed in unfamiliar airports for layovers relying on his white cane to find his way to his next gate. When it came to adventure, they were both clearly cut from the same unshrinking cloth. I met William early in the morning at the start line of the 2007 Los Angeles Marathon. I was field producing live start line interviews for Telemundo and Adrian was one of my subjects. KNBC was featuring Adrian and William in their broadcast so they were being interviewed before the race. There in Universal City just off the 101 Freeway, in the corral reserved for the elite runners I exchanged a professional handshake with William. I was struck by the brilliance of his blue eyes and by the unusual mix of confidence and humility that radiated from him. He was completely unconcerned with the cameras and more focused with stretching to stay limber and warm. With the heat and the hilly new course, neither Adrian nor William were able to run under 3 hours that day. I ran a 6-hour race then went home and watched the broadcast on Tivo. From my couch I watched reporter Patrick Healy ride up next to Adrian and William at Mile 10 of the course and joke that this was the only way he could keep up with the two of them. William ran with Adrian until Mile 16. Worn out by the additional effort that guiding requires, it was time for the cyclist guide to take over and for William to run his own race. This is not the last I would see of either one of them. In 2008 I married Adrian at the Run-Thru Wedding Chapel in Las Vegas. By then I had spent more time with William and I had also become familiar with his “fly by the seat of your pants” lifestyle. He had emailed me his mailing address for our wedding invitation but had never acknowledged it or gone online to our wedding website to RSVP. Very early on the morning of our wedding as we walked in the darkness with our running wedding party to the corrals outside the Mandalay Bay, Adrian’s phone rang. It was William. He was in town for our wedding and wanted to know where to meet us. Had it been anyone else I might have been annoyed but it was William and I already knew he had this way of just turning up. In October of 2007 he had turned up unexpectedly at the St. George Marathon and stepped in to guide Adrian at the last moment when anxiety overtook Adrian’s first guide. There were also a couple of other times when he and Adrian ran into one another unexpectedly at race expos and he always made time to help Adrian get around without ever making him feel like a burden. With all of this in mind, we didn’t give another thought to William’s surprise appearance at our wedding. It turned out that William, not wanting to support corporate greed and a tourist town that refused to support sustainable energy, had slept in his car. After a long workday, a long drive to Las Vegas and just a few hours of sleep, William fell asleep at our Gospel Brunch Reception. Guests seated next to him at the communal tables did not know what to make of the young man, plate piled high with vegetables and greens, sleeping upright with his fork in hand. It may have seemed odd to them but to us, it was just William. Over the years I developed my own friendship with William. We had Adrian in common and we also shared an interest in animal rights. I was willing to drive hours to rescue dogs who had been abused and discarded. William on the other hand, did not believe human beings had the right to slaughter animals for food or even take eggs from a chicken. Though our motivations were different, we shared a similar point of view. In spring 2011, I produced a Toyota Prius Records campaign introducing the new family of Toyota Prius Vehicles. It was a live 2-day, 20-hour webcast in conjunction with United Records Database. The youth market webcast featured people setting all sorts of records in and around Prius vehicles. The new line of vehicles included the Prius Plug-In. While we were prepping the job, the agency Creatives along with Dan Rollman, co-founder of URDB joked about finding a “science nerd” who could not only determine the algorithm for charging the Prius with energy from a bicycle but was also fit enough to ride the bicycle long enough to charge the car. As luck would have it, I had their man. I have to admit I was a bit concerned about William’s “fly by the seat of your pants” attitude interfering with the tactical elements of the production. My fears were allayed almost immediately because once he committed he showed up on time for everything. I felt like his proud older sister on the day when we shot his segment. He was so genuinely excited and articulate about the science behind the sustainable energy. He was also an incredible sport. He rode the bicycle for 3 hours in his sky blue Toyota Prius Records track suit to give the car battery a one percent charge. He never complained. It was an earnest effort to support the messaging about sustainable energy that he believed in so passionately. These words so inconsequential last October, carry significant weight for us all today. They are hauntingly prophetic yet somehow comforting now that William is gone — taken from us without warning.